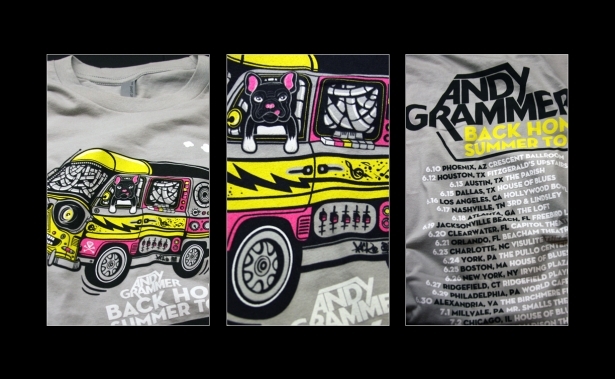 When platinum-selling recording artist Andy Grammer set out on his Back Home Summer Tour, he reached out to Miami artist John Lacko to create the graphics for promotional tees, hats and totes that are such an important part of funding any musical road trip. His management team admired the work Lacko recently completed for Diplo’s Major Lazer project and wanted to capture some of that same energy for Grammer’s promotional gear. 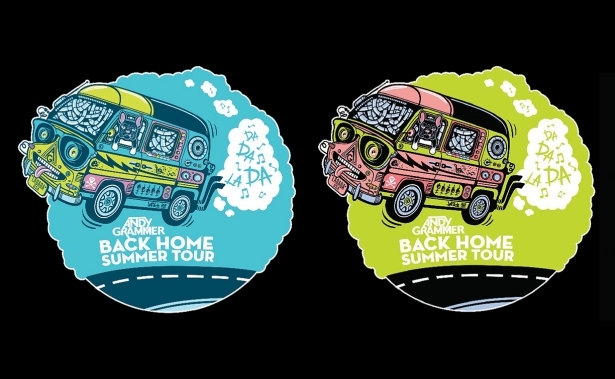 The design elements had to feel like home and homecoming, part of the theme of Grammer’s first single, “Back Home” [ http://tinyurl.com/nsbjo6r ] with sentimental lyrics about friendship, minivans, and the enduring nature of returning to where he started. The first video for the song includes sunny shots of friends and bandmates traveling together, playing cards and singing songs on the way to the next gig. Once Grammer reaches the stage, the audience sings and dances under clouds of colorful smoke. As the song hits its final chorus, Grammer stage dives out into the crowd. 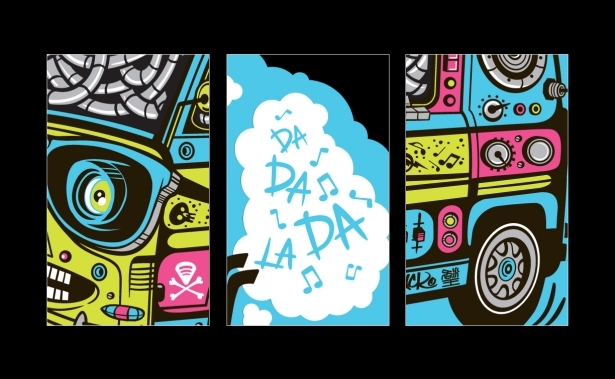 Lacko set the project in motion with a goofy band bus that’s kitted out with giant speakers, filled with miles of tangled wires and Grammer’s dog at the wheel. 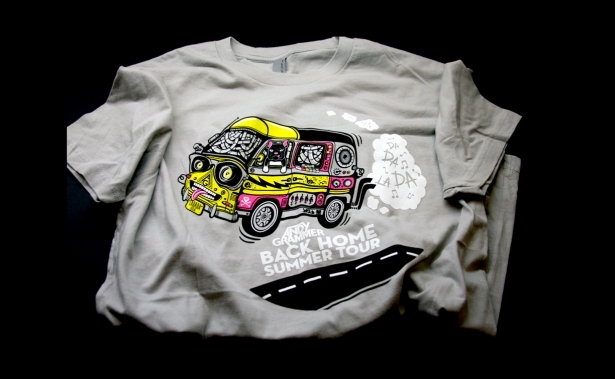 The van has cheap sunglasses across the headlights and a wide grin spreads along the grill. To give the sloppy jalopy added appeal, clouds of smoke belch from the twin tailpipes that billow into happy clouds of music. The van bounces across the highway making a joyful noise wherever it goes. This entry was posted in Altpick, Art and tagged Andy Grammer, Diplo's Major Lazer Project, john lacko, merchandise, music, promotional gear, Recording Artist. Bookmark the permalink.